You are currently browsing the tag archive for the ‘Jeanne Cavelos’ tag. That answer is: You’ve already bought a book whose whole purpose is to discuss meaning and consequence in the Star Wars Universe! Everybody who contributed, from accuser to defender, believes there is something worth arguing about. We’ll do it because the topic matters, or because it’s fun to argue, or because we’re being paid to argue. Most likely, all three. A few weeks ago I had the pleasure of speaking to Alexandre O. Philippe, director of The People Vs George Lucas (interview for Filmink magazine here). The film itself is well worth checking out, as it perfectly captures the – to outsiders – seemingly inexplicable fanrage of Star Wars devotees. However, even if the rantings and ravings on camera are not something viewers can relate to, a person would be very hard-pressed to claim they had no idea what Star Wars was, or who George Lucas is, or even – what is the Force? So from that point of view, it is difficult to write off the science fiction franchise as being ‘just for kids’, although on the opposite extreme it is equally hard to insist that it is actually a twentieth century monomyth with a straight face. Confusingly Lucas himself has made both claims. That is just a hint of how contradictory the man’s relationship with Star Wars is. 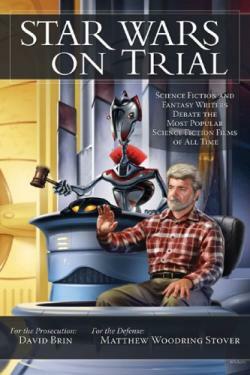 Star Wars on Trial amusingly sticks to a court-room cross examination of the franchise itself, its strengths and failings, and the effect it has had upon the various industries swallowed up by Lucas’ empire. David Brin, following on from his evisceration of The Phantom Menace in 1999 for Salon, argues for the prosecution. Matthew Woodring Stover, also a science fiction writer, is our plucky court-appointed defence lawyer. Perhaps that is where the problem lies with this book. Brin is presenting a critique of a series of films and their subsequent spin-off materials on the understanding that this is an intellectual exercise. Stover appears to think he is in Law and Order. The banter between the two ‘opposing counsels’ starts off being amusing, but as the argument progresses, the Lucas loyalist seems worryingly earnest, becoming insulting even at times. To wit, his attempt to frame Jeanne Cavelos’ excellent piece ‘How the Rebel Princess and the Virgin Queen Became Marginalized and Powerless in George Lucas’s Fairy Tale’, as an appeal for overt onscreen cruelty towards female characters (this is in response to the complaint that the heroine Padmé dying of a broken heart is dubious at best in this technologically sophisticated universe). The witnesses are themselves writers or cultural theorists, who present their evidence and are then questioned by Brin or Stover. Amusingly a ‘Droid Judge’ presides over these interactions. The topics argued include the political subtext of the series, its status as science fiction – Brin argues that it is fantasy literature in drag, the would-be mythic significance of Lucas’ work, alleged plot-holes, mischaracterisation of women within the franchise and finally its legacy for the film industry. This book has one undeniable highlight for me, a moment of pure ‘gotcha’ brilliance. For years I have heard that the Force draws upon Buddhism, Taoism, y’know that whole ‘Eastern’ lark, to pad out its pseudo-religious significance. Witness for the prosecution John C. Wright disabuses Stover of that notion quite brilliantly during the cross-examination. Robert A. Metzger mounts an especially, uh, interesting defence, arguing that Lucas has actually created a work of Gnostic significance. I found that quite fun, but hardly convincing. One point that is made, and relates particularly to Stover who has written novelizations of the films, is that this ‘Lucas empire’ has provided a lot of writers and creators starting out with excellent opportunities. However, the counter-argument is that this in turn has led to a monopolization of both film and publishing, with science fiction itself sandbagged by the imagery and concepts of Star Wars, excluding ideas and concepts too alien for a galaxy far far away. Overall I found this to be an intriguing and entertaining dialogue on Star Wars, but also an occasionally frustrating one. Thankfully it is more thoughtful and well-reasoned than your average chatroom debate though.